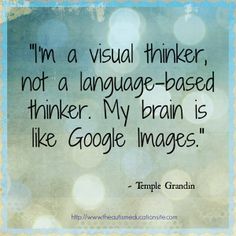 I’m sure that many of us can relate to the concept of visual thinking as many of us may have a preference for learning in a visual way. For children with Autism, understanding this visual way of thinking is important to teaching all kinds of skills. When James was under 4, he required lots of routine. We would take pictures of the different steps in the day (eg getting dressed, eating breakfast, brushing teeth etc) and create a visual support. Now with iPads there are apps such as ChoiceWorks which make this process so quick and simple. https://itunes.apple.com/au/app/choiceworks/id486210964?mt=8 Even just 5 years ago I had to resort to laminated pictures and Velcro to create visual supports and routines. Using these visual supports reduced his anxiety about many things. We could use the routines to prepare him for changes and it provided support for him when he was unable to talk (James didn’t talk until the age of 4). 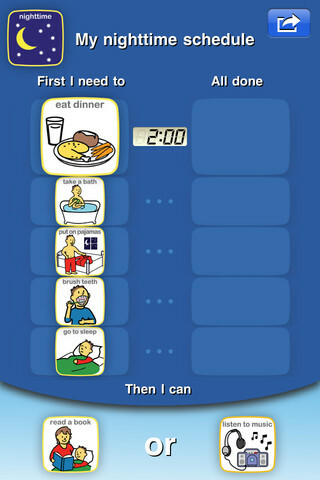 These days we use visual supports to help him get organised (checklist of things required) and for schedules. An example from the ChoiceWorks app. We use this app for everything from checklists to schedules. It’s really quick and easy to use. It allows you to import your own photos so you take pictures of the child’s ‘real’ environment to place into the sceuldes. Highly recommend. Social Stories are another visual strategy recommended for use in individuals with Autism. Carol Gray coined this term and has written a lot on the subject. http://www.thegraycenter.org/social-stories You can use a social story for any purpose – to teach something new, to address a behaviour, to help establish a routine. Social stories can just be quickly sketched into a book or more formalised with pictures and text. Again, this strategy appeals to visual thinkers. Using visual schedules for routines, self regulation (wait cards, break cards), flow charts, photographs, and even just sketching stick figures to reinforce a behaviour or concept can be really effective in reducing anxiety and increasing engagement for individuals with autism. If there is a way to present something visually – do it! This entry was tagged Autism, visual supports, visual thinking. Bookmark the permalink. I am doing my undergraduate topic on Autism and raising two nephews with autism. please email me some information and programs to attend.